"A culinary delight, best prepared with eggplant fresh from the garden!" Preheat oven to 350 degrees F (175 degrees C). Cut eggplant in half, scoop out the pulp, leaving a 1/2 inch shell. Chop the flesh finely. Heat 2 tablespoons olive oil in a skillet over medium heat. Cook chopped eggplant for about 1 minute. Stir in onion, garlic, and parsley, and cook until tender. Transfer to a large bowl, and mix in bread crumbs, 1/2 cup Gruyere, chopped olives, capers, and lemon juice. Season with basil, pepper flakes, salt, and pepper. Stuff into eggplant shells. 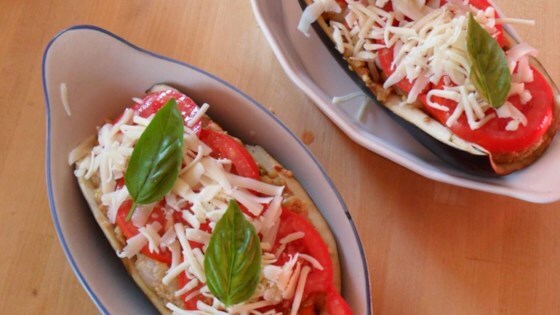 Top stuffed eggplants with overlapping slices of tomato. Sprinkle evenly with remaining 1/4 cup cheese, and drizzle with remaining 4 tablespoons olive oil. Place on baking sheet. This was very easy and extremely tasty! I used Asiago cheese instead - I also baked on a cooking stone. I added more garlic/onion and hot pepper. Excellent, will make again! This is so good it has become one of my regular dinners! One large eggplant cut in half makes a great filling meal in itself for two people. I used cheddar chesse in the stuffing (that's what I had) and spinkled parm. chesse on the top. This is a really good recipe I will be making it again.